I’ve probably said before that I came into this world with a ravenous appetite. When I was a child, raiding the refrigerator was one of my favorite pastimes. My Mom would regularly look for something in the fridge that she had planned for dinner, and whatever she was looking for disappeared days ago as a snack for little Billy. I was indeed an expensive child to feed! After my post-school snack, I’d usually be hanging close to the kitchen to see what Mom was cooking for supper. She was a great cook, but she typically made pretty basic southern fare. On occasion, she prepared stuffed peppers, a real treat for my young appetite. Her preparation consisted of the classic stuffing of hamburger meat, onions, and rice and topped with tomato sauce. My sweet Mom is now 91 and doesn’t cook anymore, but I have such fond memories of spending time with her in the kitchen. In honor of my Mom, I made a variation of her stuffed peppers with ground chicken, farro, corn, tomatoes, and basil. I topped the peppers with a combination of Parmesan and fresh mozzarella cheeses. 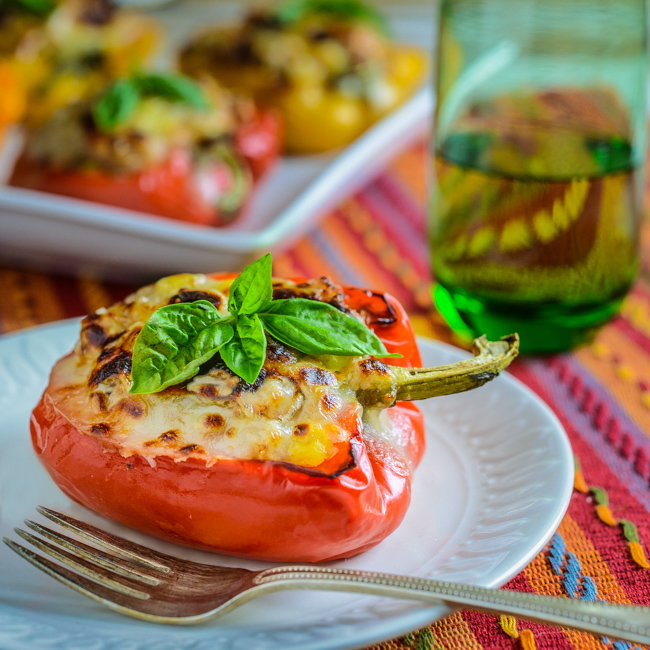 This recipe makes 12 stuffed pepper halves, but you can halve the recipe if you want a smaller quantity. If I’m going to the trouble to make these peppers, though, I definitely want leftovers. 1. Bring chicken stock to boil in a medium pan. Add farro, reduce heat, cover, and simmer for 20 minutes. Drain and set aside. 2. Add about an inch of water to a large pot and bring to boil. Place a steamer insert in pot and place pepper halves in pot. Cover and steam for 15 minutes. Remove peppers from steamer. 3. Heat olive oil in a large skillet over medium high heat. Transfer onion and garlic to skillet and saute for 2 to 3 minutes or until onions are slightly browning. Add ground chicken and break apart with a fork. Continue cooking, stirring regularly for 3 to 4 minutes until chicken is cooked through. 4. Add corn, tomatoes, basil, cooked farro, salt, and pepper to skillet and stir to combine. Continue cooking for 2 to 3 minutes. Remove from heat. 5. Preheat oven to 400 degrees. Place pepper halves on a large baking sheet. Fill each pepper with chicken and farro mixture. Top with Parmesan cheese and fresh mozzarella. 6. Bake for 20 to 25 minutes until cheese is melting. Change oven setting to broil and cook for 1 to 2 minutes to brown cheese. Watch carefully during broiling stage so you don't over brown cheese. My mother made a lot of those hamburger stuffed bell peppers as well. 🙂 Love your variation with the chicken and then the cheese topping. With your stuffed bell peppers, I could actually learn to love them! Such gorgeous photos Bill! Your mom taught you well -these peppers sound delish! Normally when I see anything regarding stuffed peppers I get my ‘Green Pepper Haterz’ face on but I saw red and yellow and that made me so much happier. I ignored these lovely colors for years because of their relationship to the dreaded green; it’s a shame I know but I’m trying to make up for lost time! Lovely recipe and photos Bill. Not only is this colorful and tasty looking…it’s healthy. You do make beautiful food. I love stuffed peppers but not had them for sooooooo long. Thanks for the reminder. I love hearing about your mom looking for a missing ingredients. That kinda cracks me up. I also love knowing that you loved stuffed peppers as a kid. I did too! These are so yummy looking Bill, love the way you’ve updated the recipe.